Mp3 Index Maker can do more for you than just archiving your mp3s. For a list of features, see the next section. Use the integrated mp3 player to listen to them. Edit the ID3Tag. Pissed off with having to change each one manually? With one or two... ok... but on 100? Well, do not waste your time! 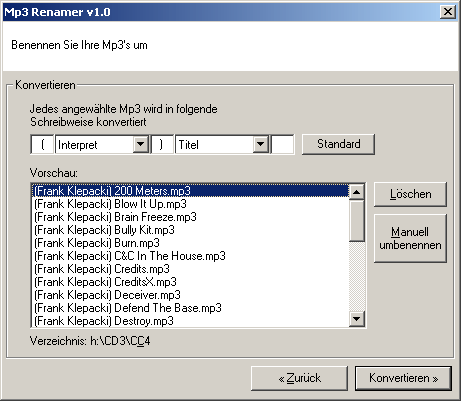 While you would give up naming each one after 10 minutes, mp3 Index Maker can do all 100 in 10 seconds! Easily edit the file names. Have one way of naming mp3s applied to the ones you just downloaded. You have thousands of mp3s on your hard disk in thousands of directories? Make Mp3 Index Maker search them all and list them.